Marlins infielder Derek Dietrich hit .214 with nine home runs and 23 RBI in 57 games upon his May 8 call-up. JUPITER, Fla. — Like many young players, Marlins infielder Derek Dietrich faced his share of ups and downs. When Chris Valaika went on the disabled list last season, Dietrich earned his major-league call-up from Double-A Jacksonville on May 8. It was less than six months after he was acquired from the Tampa Bay Rays organization for shortstop Yunel Escobar. "You always stay ready," Dietrich said. "You never know. This is a crazy game. There’s a long season, things happen. We had a lot of guys come and help the team all season long. You just have to stay ready and when the opportunity comes take advantage of it." Dietrich singled off Padres right-hander Jason Marquis in his first at-bat. He belted a home run against Dodgers righty Matt Magill two days later. While he produced 21 extra-base hits — 10 doubles, two triples and nine homers — in 233 plate appearances, he also struck out 56 times and walked on 11 occasions. His power earned comparisons to Phillies second baseman Chase Utley. "I did some things well," said Dietrich, who posted a .214 average and 23 RBI. "Everyone has something to work on, and for me it’s becoming more consistent. And that’s the goal for every player whether you’re a 10-year veteran or a first-year big leaguer. That’s the name of the game, becoming more consistent. That’s my focus going into this season — taking what I did well and becoming more consistent." On July 22, the Marlins optioned Dietrich to Jacksonville as his inconsistency continued at the plate. He struck out twice in each of his last four starts with just three hits. A few days later, hitting coach Tino Martinez resigned amidst allegations he physically and verbally abused players, including Dietrich. Dietrich is happy to move on from that and focus solely on baseball. 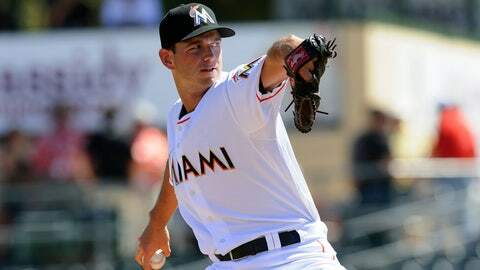 Even while he was in the minors he continued to follow the club and cheered along as righty Henderson Alvarez threw a no-hitter on Closing Day. "Brand new year," Dietrich said. "Couldn’t wait to get here to be around the guys. Lot of fresh new faces, plus some guys returning. I was just looking forward to getting out there with the team. This is the best part about spring training is seeing everybody again, getting out on the field. 2014 is going to be a good year for us." Defensively, Dietrich has had to learn a new position, second base, after coming up as a shortstop in the amateur ranks and professional baseball. He committed two errors in 57 games, recording a .992 fielding percentage. Over four games this spring, the 24-year-old has split time evenly between second and third, the latter which he played at Georgia Tech and with Jacksonville. Manager Mike Redmond said first base is even a possibility. In four games, Dietrich is batting .273 (3 for 11) with two doubles, two runs and an RBI. He has struck out three times and has not walked. "He’s a guy that we really like, and he needs to continue to play and just continue to show what he can do and his versatility," Redmond said. "I like his swing. He’s a guy who brings it every day and wants to win. He just needs to continue to go out there and prove and show his versatility and hit."